This article was originally published on Liberty Hangout. On Wednesday, December 6th, 2017, Students for Liberty (SFL) fired Noah Mickel. Mr. Mickel has been a campus coordinator for SFL since his first year in college. The alleged reason for this firing is “violating the respectful communication policy,” but there is ample reason to doubt this justification. 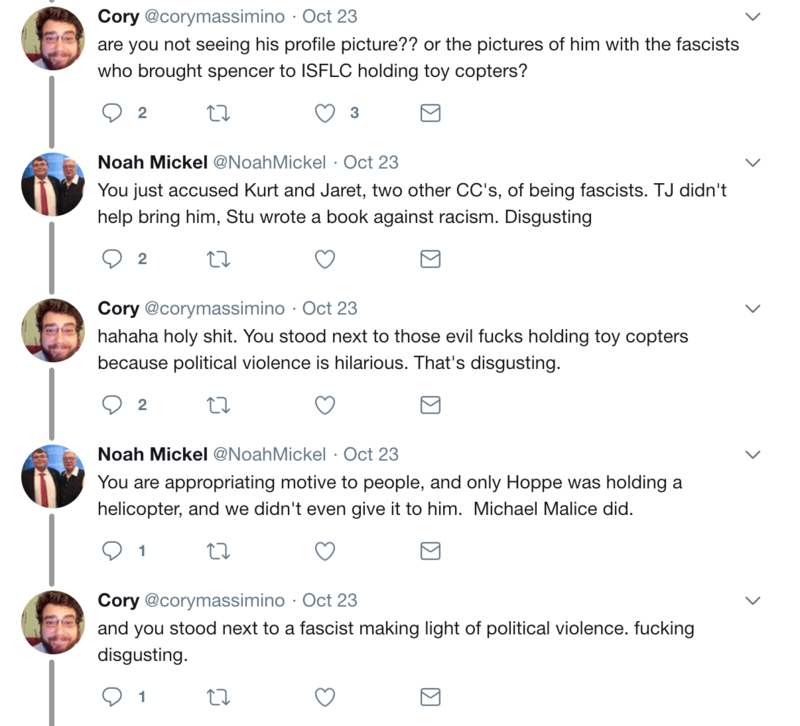 To start, Mr. Mickel is a right-libertarian who unapologetically supports libertarian theorist Hans-Hermann Hoppe, whose works Students for Liberty has banned at their events. Mr. Mickel wasn’t exactly quiet about his views, and he has caused other SFL staff members to dissent from the organization’s heavily leftist executive board. So why was Mr. Mickel fired, but not Mr. Massimino who called members of his own organization “evil fucks?” Mr. Mickel and many other former associates of SFL are inclined to believe it is a leftist bias within Students for Liberty (a.k.a Stupids For Liberty). Students for Liberty has very close ties with Center for a Stateless Society, an organization that is explicitly anti-capitalist. While libertarian in name only, C4SS has a dark history of anti-liberty content, such as an article claiming the world would be a better place had someone shot Murray Rothbard and Ron Paul. Somehow Mr. Mickel is “disrespectful” enough to get fired, yet a violent communist organization’s members are welcome with open arms to Students for Liberty, even occupying their executive ranks. Mr. Mickel has had past run-ins with SFL’s thought police as well. In August of this year, he assisted SFL in planning their 2017 regional conference in St. Louis. When Mr. Mickel suggested that SFL invite Tom Woods, a popular libertarian historian, and commentator, the organization struck down his proposal, claiming Woods is “too controversial”, opting instead to invite Gary Chartier, a senior fellow with C4SS. Although Mr. Mickel was not fired for attempting to invite Woods to this event, he does claim to have been harassed by SFL staff over this incident. What’s incredible is the Orwellian nature of this incident. Simply put, SFL didn’t think this would be bad for them because they didn’t want the public to know Woods was an option. These screenshots depict Mr. Mickel discussing the implications of SFL leadership (Including Anna Richter, SFL Great Plains Regional Director) rejecting the presence of Woods even though they will happily invite a figure from the leftist Center for a Stateless Society. As Mr. Mickel says, it confirms the suspicion that Students for Liberty has a strong bias against right-libertarians. Of course, that isn’t the public perception because the public never knew Mises people like Woods was an option. Inviting Woods and taking a picture with Hans Hoppe isn’t the only reason a left-libertarian wouldn’t like Mr. Mickel. He is, in fact, a Liberty Hangout guest contributor. His most recent article was an intellectual critique of left-libertarianism. This article was published a mere two days before Students for Liberty decided to fire Mr. Mickel (Coincidence? I think not). Based on the article, one can see that Mr. Mickel is an amiable young man with a great intellectual capacity. The fact that he is kind, personable, and opposed to left-libertarianism puts the leftist hegemony C4SS has established in SFL at risk. Firing Mickel on the absurd grounds of “disrespectful communication” is certainly one effective way to eliminate said risk. Upon being fired, Mr. Mickel released a public statement one can watch below. This isn’t the only incident of a student being bullied and harassed by figures in SFL for being a right-libertarian. In fact, another student activist created a form with which anyone can share their experience of leftist bias, bullying, or harassment within SFL. One can access this form here. Students for Liberty has lost more than Mr. Mickel and their credibility with right-libertarians. They have also lost seven other staff members, who decided to resign after hearing of Mr. Mickel’s termination. Although most these individuals chose to remain silent, some are coming forward. Mr. Kurt Faulhammer, a campus coordinator who chose to resign upon hearing of Mr. Mickel’s termination, claimed that he had been frustrated with SFL since they invited Bill Weld to their regional conference in NY. To Mr. Faulhammer, firing Mickel was the straw that broke the camel’s back. Another recently-resigned Campus Coordinator, who requested to remain anonymous, said that “it seems like SFL has gone down the toilet at this point with their left-libertarianism.” Giancarlo Diaz, another Campus Coordinator who quit upon hearing the news, said “SFL presents itself as an organization for big tent libertarianism but through my casual experience in SFL and through Noah’s termination; I believe I can justifiably say the SFL has a bias toward ‘right-wing’ libertarianism. I have personally not been in the organization long nor have I done much to contribute as I felt conflicted between supporting a group who had a bias against my ‘right-wing’ libertarian beliefs. Noah, on the other hand, was an adamant member of SFL who earnestly participated in the organization and was terminated nonetheless for expressing views that should reasonably fall under big-tent libertarianism” in an email to David Clement, SFL’s North American Programs Director. Although I requested comment from Students for Liberty, they neglected to comment. In a comment to me, Noah Mickel said: “I wish SFL the best, and I’m incredibly disappointed that this happened.” He also requested that I share a fundraiser he is hosting for the Ludwig von Mises Institute. If one supports the spread of principled libertarianism, you can donate to the Mises Institute here.